There is a respected member of a popular Rotax list asserting that the Ducati regulator can be harmed by too little load. I don't believe this to be true, and it interests me directly because my wiring architecture has the regulator, under normal conditions, supplying only my primary fuel pump (it can be tied to the main bus if necessary). To those of you familiar with the Ducati regulator, is there any truth in the assertion that a light load is bad for it? I am on your side Ken. Roger should should reference the schematic and the laws of physics to explain why too little of a load can damage the rectifier/regulator. The greater the current, the greater the heat. A small load will result in less heat. Some regulators "regulate" by dumping the excess power generated by the generator. They dump the power by shorting it to ground. A direct short would be a weld, so the regulator stands in the middle and acts as a heater. If there is no load on the electrical system, the regulator is being heated by everything the generator can put out. But, really, it is a poor engineer that could not have anticipated and and properly designed for that eventuality. Of course, the proper design may have been to install it in the exact position on the motorcycle that they designed it to be install in (with its accompanying blast air). Agreed. Some regulators regulate by adding a parallel resistance to short out excess current. Some regulators regulate by adding a series resistance to limit the current. Some regulators regulate by turning the output on and off rapidly. The ratio between the on time and the off time controls the average current. The Ducati is the on-off type. It does not waste as much heat as the first two types. But it still gets very warm due to IR losses. The greater the load, the greater the heat. people who actually conducted experiments. during our build, a short report of which can be seen here on Contrails ! no further bench tests have been reported. Thank you Joe and Ernest. Thinking, and that for me is dangerous. The alternator in a Ducati or similar system is not controlled. It's output is dependent on its RPM. I have two Honda motorcycles that use the same type of system. To test the alternator one checks the output voltage from each of three windings. The expected voltage is in the range of 45 to 70 volts on each winding. When the vehicle system is not demanding any output from the rectifier/regulator the alternator output must go somewhere. It is converted to heat. Heat is the enemy of electronics. I may be way out in left field on this but it makes some sense to me. I have one failure of the charging system on my Hondas. It was the regulator. My wonderful wife brought the car so we could put a little charge in the battery. It took two or three charges to get home. I miss that lady so much. This would be hard to do with an airplane. Some regulators regulate by turning the output on and off rapidly. The ratio between the on time and the off time controls the average current. The Ducati is the on-off type. It does not waste as much heat as the first two types. But it still gets very warm due to IR losses. The greater the load, the greater the heat. 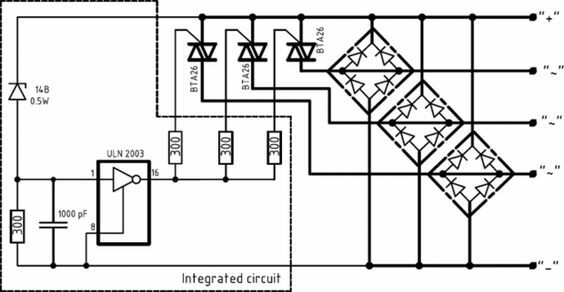 silicon controlled rectifier or triac will not . . .
irrespective of instantaneous bus votlage. The alternator in a Ducati or similar system is not controlled. batteries and running electrowhizzies . . .
nobody does that any more . . . VERY inefficient. rectified and pumped directly to the bus. across the windings of the alternator . . .
low system loads, the SCRs will be working hard . . .
the failure to some other component in the system. above, it's hard to beat the simplicity! a 'shunt regulation' topology . . .